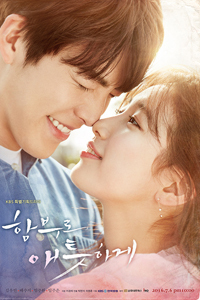 A poster of "Uncontrollably Fond"
Whether it is the formulaic romantic comedies from local broadcasters or the viewers becoming increasingly bored with familiar material, TV stations have been suffering from falling viewership rates for years. Diversified broadcasting channels have aggravated the situation and now anything over 10 percent in viewership is considered a success. Throughout last year, among the weekday dramas, SBS medical thriller "Yong-pal" was the only one that narrowly topped the 20 percent rating mark. 2016 has been a year that has put an end to this. The year opened with the famous "Reply" series. Somehow success was expected for the third installment of the popular family drama — the highly acclaimed "Reply 1988" was a milestone, the final episode of which recorded almost a 20 percent viewership, the highest rate in Korean cable television history. But what really made a phenomenal change was the KBS wartime romance "Descendants of the Sun." The drama, starring Song Joong-ki and Song Hye-kyo, was aired almost simultaneously in Korea and China and it captivated both countries when it aired from February through April. The drama premiered with 14.3 percent viewership and ended with a nearly miraculous 40 percent rating, a record that other K-dramas have yet to break. The show revived hallyu, or the Korean pop culture craze, that was in decline over recent years. Overall, 2016 has been richer than ever with well-made quality dramas. Based on solid plots, beautiful cinematography and great performances of actors, various dramas, including KBS's fantasy period "Love in the Moonlight," SBS's "Doctors" and the tvN romantic comedy "Another Oh Hae-young," have succeeded in the viewership rankings. Star writers returned to the small screen this year, adding excitement for drama fans. Park Ji-eun, who wrote the 2014 megahit drama "My Love from the Star," returned with the on-going SBS fantasy romance "The Legend of the Blue Sea," featuring two big name hallyu stars Jun Ji-hyun and Lee Min-ho. "Descendants" writer Kim Eun-sook came back with "Guardian: The Lonely and Great God," while Song Jae-jung, who wrote the sci-fi romance "Nine: Nine Time Travels" came back with "W — Two Worlds." Screen writer Kim Eun-hee of "Sign" wrote the crime drama "Signal" and won acclaim as a master of the genre. This year has seen the sudden rise of dramas that finished shooting entirely before official broadcast. Following the success of "Descendants" many other drama producers have tried to adopt this film-style, in contract to the common practice here where scripts are handed over to directors and actors on the day of the shoot and editing is completed just hours before an episode goes on-air. The new production style, in part because of the Chinese government regulations that all dramas have to be screened prior to airing, has raised great expectations for other such dramas but none of them came near the success of "Descendants." "Uncontrollably Fond," a pre-recorded SBS drama that was largely expected to become the next hallyu drama hit, with heartthrob Kim Woo-bin and Bae Suzy, flopped, while the star-studded SBS drama "Moon Lovers: Scarlet Heart Ryeo" also suffered with poor ratings. "Uncontrollably Fond" was criticized that the production company hired Chinese market friendly handsome cast members whose acting performances didn't live up to their names. TvN's ambitious star-studded drama "Entourage," a remake of HBO's popular show, joined the ranks of losers. 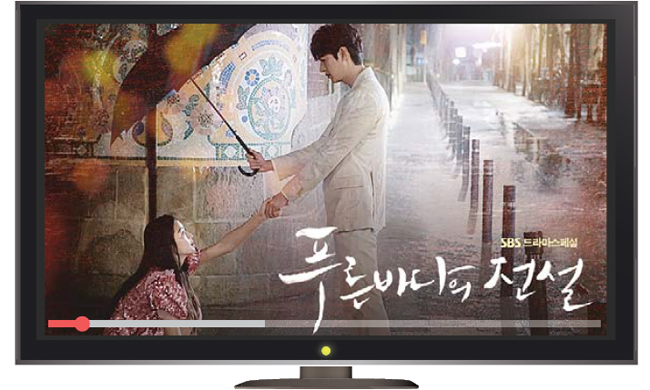 Despite the initial hype prior to the broadcast, the drama's viewership posted 0.6 percent. The new system has been implemented to increase drama exports to China, but the political dispute between Korea and China surrounding the Seoul's deployment of the Terminal High Altitude Area Defense system have cast a shadow over the K-drama industry this year. Amid the reports that Beijing had issued a tacit ban on all Korean cultural content, "Saimdang, the Herstory," which was originally to air this fall, was postponed. "Guardian: The Lonely and Great God" and "Legend of the Blue Sea," which could have earned at least 10 billion won each from Chinese buyers due to the popularity of their writers and cast, instead let pirated versions enjoy popularity in China's online social networking platforms. Cable channel tvN's success has been noteworthy this year — fresh story material and different genres have led its popularity. Many A-rated actors and actresses including actress Jeon Do-yeon and actor Gong Yoo have chosen to return to the small screen with cable dramas, while star writers prefer cable for their creator-friendly environment and more leeway for story-telling. A time travel crime series "Signal" earned huge success, concluding with a solid 12.5 percent viewership on the cable channel, where anything above 3 percent is considered successful. Romantic comedy "Another Oh Hye-young" staved off the typical Cinderella story and tells the love story of an unlucky woman named Oh Hae-young who keeps suffering mishaps due to her charming colleague of the same name and a sound director who has the ability to see the future, making the less known lead actress Seo Hyun-jin shoot to instant fame. TvN's "Dear My Friends," dealt with rarely told stories of friendship in the last years of life, while "The Good Wife," the Korean adaption of the popular CBS series of the same name, and action thriller "The K2" have earned critical acclaim. The on-going fantasy romance "Guardian: The Lonely and Great God" is dominating the scene with its movie-like cinematography and unprecedented love story between an immortal goblin and his search for a human bride. As soon as "Guardian" debuted, it topped the TV drama chart, even surpassing Descendants of the Sun. The poems which were included in the lines of Gong's character in the drama, have gained renewed attention, while the drama's original soundtrack including Crush's "Beautiful" is dominating the local music charts.